Who remembers Paris Hilton's insanely massive diamond engagement ring? We certainly do. As one of the biggest rings Hollywood has ever seen, Hilton's is a memorable one, as are large-and-in-charge sparklers in general. Of course these "big" engagement rings are covetable, but understated small engagement rings are equally as statement-making (though not in the typical sense of the word)—we're talking rings designed with tiny diamonds and delicate bands that are perfect for the minimalists among us. Small engagement rings have quickly become a popular choice among brides-to-be, especially with the steady rise of the minimalist jewelry trend. And as such, we thought we'd curate an edit of the most eye-catching (though not overly attention-grabbing) styles we're certain everyone will love, especially those who appreciate the simplicity and understated nature of minimalist fashion. Ready to see what we found? 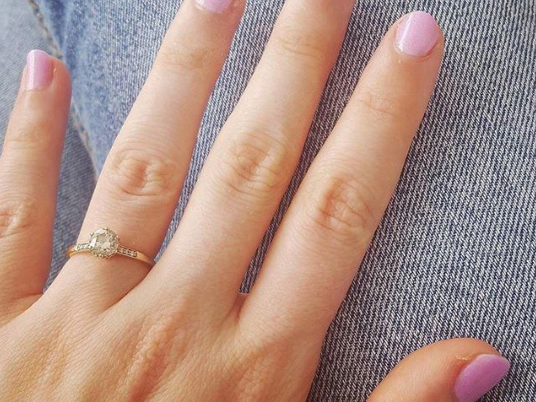 Read on to shop 30 simply stunning small engagement rings we're coveting right now. We love an open diamond ring. 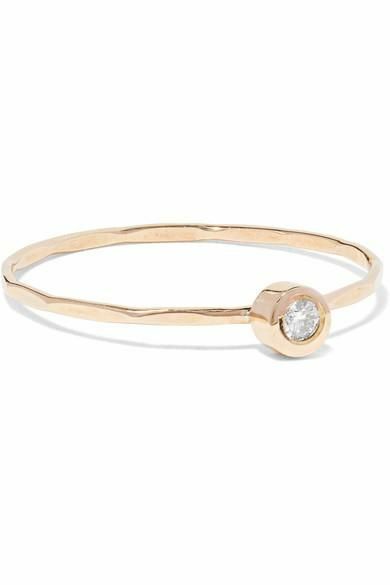 This dainty gold diamond ring is just perfect. How eye-catching is the band on this ring? Try one with an emerald stone. Sterling silver rings are a classic. We love that this ring is adorned with a stunning amethyst. Pearls and diamonds are a match made in heaven. Opt for a unique diamond shape, like this triangular-cut style. Or how about a square diamond ring? A ring for a queen. Add a subtle pop of color with this ring. Another diamond and pearl engagement ring we're loving right now. We're all for this unique evil-eye diamond ring. Go geometric with this pared-down engagement ring. Customize this with your birthstone. So simple but oh so beautiful. What's not to love about this ring? You can't go wrong with this diamond ring. This style exudes simple elegance. Another understated pick we're obsessed with. This ring is inspired by the night sky—how cool is that? We love the addition of a single pink and blue sapphire on each side of the ring. A classic princess diamond ring is always a great choice. Another perfect open-band engagement ring. A simple ring with an eye-catching open triangle band. Next up, shop the ruby engagement rings that are perfect for stylish, unique brides.